To our great regret, it has been a while since Mr CTC and I indulged in our favourite pastime, having a cream tea. The other day, we were passing through Huddersfield, and I remembered a teashop that had been recommended to me by a colleague. 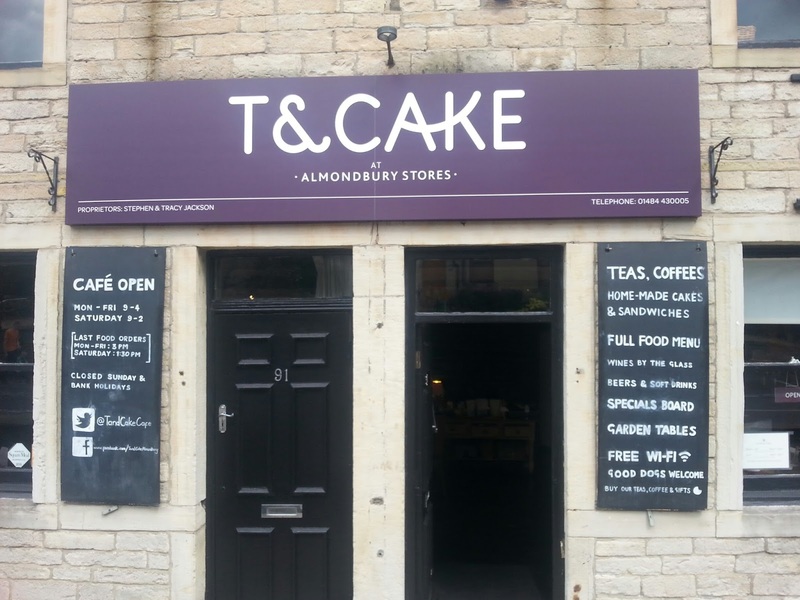 It is charmingly called T & Cake, and sits on the high street in Almondbury. Almondbury is one of those parts of a larger town or city that has a real village feel, like Greenwich Village or those in London such as Twickenham or Walthamstow. Almondbury's high street has independent, local butchers, bakers and hairdressers, and you can see the rolling Yorkshire hills and green fields over the rooftops. We popped in for lunch at about 12.30, and were told that we needed to wait for a table, on the comfy sofas provided. While this is a great sign, that the food is obviously popular, we wondered if perhaps the owners could accommodate more tables where the large sofas were taking up room. Pretty soon, a table came free and we sat near some lovely mullioned windows and perused the menu. 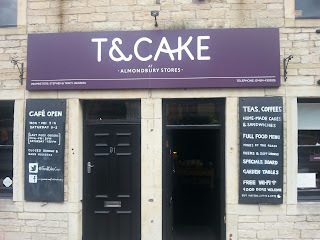 I was pleased to see a delightful choice of teas, including some bespoke to T & Cake, that I had never heard of before. It was a hot day, however, so I chose an ice tea, and was pleased to discover that it was real, cooled tea, served with ice and lemon, rather than a highly sweetened Lipton-type variety. Mr CTC ordered a club sandwich and I had an avocado, chicken and bacon sandwich. It was absolutely delicious, although the slices of avocado that I had been expecting seemed to have morphed into a slightly green-tinged mayonnaise. Ho hum. I, unusually for me, was not in the mood to complain, so I let it slide. After this, we were quite full, but couldn't pass up the opportunity to sample the cream tea. 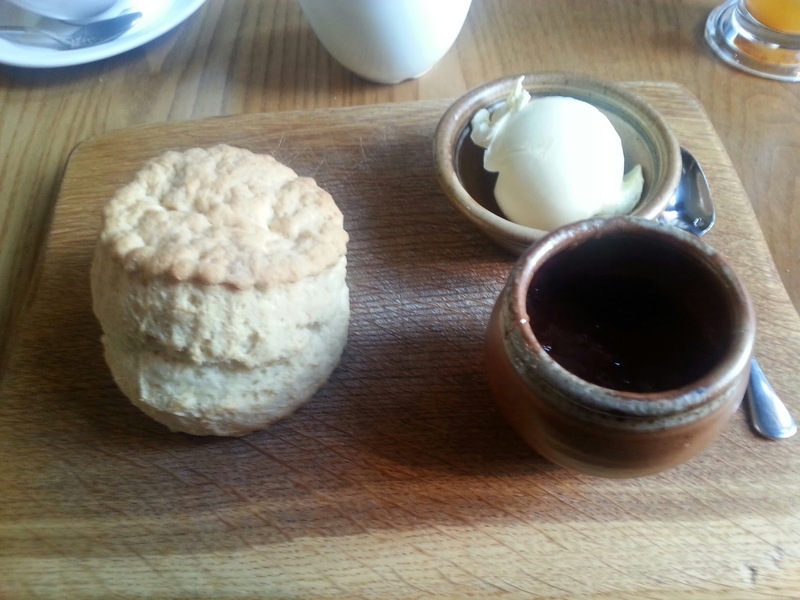 A single scone (I don't think we could have managed more) was served on a rustic wooden board, with earthenware pots for the jam and (phew!) clotted cream. The scone was warm, tall, and obviously home made. I love it when you can see the fluting from the cutter around the outside, and it had the perfect 'waist' which shows it has risen properly in the oven. For me, it lost a mark or two for being plain, as I do prefer a fruited scone. It was a lovely scone - just the right, fluffy texture, not too dense or short, and not too light. The strawberry jam was clearly home made as well, with just a hint of tartness. Hubby said it should have had more fruit in it though. The cream was missing its crust, but no matter, because it was absolutely delicious - the creamiest clotted cream I have ever tasted!